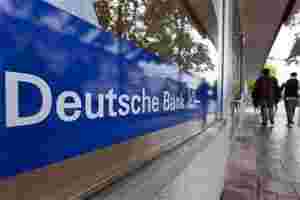 Frankfurt: Deutsche Bank posted forecast-beating third-quarter pretax profit as retail banking and asset management offset a drop in investment banking which it warned was facing its toughest conditions since 2008 and could lead to more job cuts. Weaker market activity forced Germany’s flagship lender to drop ambitious full-year targets earlier this month and announce 500 job cuts. On Tuesday the bank said it was in the process of cutting 10% of its investment banking staff. “During the third quarter, the operating environment was more difficult than at any time since the end of 2008, driven by a deteriorating macro-economic outlook, and significant financial market turbulence," said chief executive Josef Ackermann. Chief financial officer Stefan Krause said the bank would continue to adjust headcount if the market environment persisted, adding that the outlook for the sector remained highly dependent on the resolution of Europe’s sovereign debt crisis. By 0759 GMT Deutsche Bank shares were up 0.5% at €28.6, outperforming the Stoxx 600 European banking index which was up 0.2%. Pretax profit from the corporate and investment bank came to 329 million euros, down from €1.3 billion in the year-earlier period as trust services, trade finance and cash management only partially offset a 34% slump in debt market sales and trading. Revenues in credit, rates and emerging markets were all down from a year ago, although foreign exchange and commodities both had their best third quarter revenues ever, and money market revenues were also up on the year. Equity market sales and trading revenue slumped 41% from a year ago, while origination and advisory revenue fell by a third. Third-quarter revenues from fixed income, currencies and commodities (FICC) fell 49% on average from the second quarter across JPMorgan , Citi , Bank of America , Goldman Sachs and Morgan Stanley , after stripping out accounting gains. Deutsche reported a far smaller accounting gain from the value of its own debt than US rivals, with a mark up of €170 million. Deutsche Bank had a total €4.8 billion worth of exposure to the sovereign debt of Greece, Italy, Spain, Ireland and Portugal at the end of the third quarter, the bank said. Exposure to Greece alone was €881 million. Banks are under pressure to take mark down losses on their Greek bonds by at least half under a plan to make the troubled eurozone country’s debt more sustainable. Banks in July agreed to take a 21% loss on their holdings. Deutsche marked the valued of its Greek government bonds down by a further €228 million, in line with guidance given earlier this month. It has now marked down the value of the bonds by 54%. Deutsche Bank said it had a core tier one capital ratio of 10.1% at the end of the third quarter, and CFO Krause said the bank was confident it would not need public sector funds to meet more stringent capital standards being considered by regulators.